Buffy Comforter Review - Is This Cooling Comforter Worth The Hype? If you spend any time scrolling through social media apps, you’ve probably encountered an ad for the Buffy Comforter. But what you might not know is that it’s one of the most eco-friendly, ethically sourced sleep accessories to ever come to Sleepopolis HQ. So, naturally, I’m going to take a close examination of what it’s made of, how it feels, and determine whether or not it lives up to all that Internet hype! One of the most popular names in online bedding is the new Buffy comforter. It's made from eco-friendly plant based and recycled materials and has a great cooling feel! What Is The Buffy Made Of? Eco-friendly sleepers will be glad to know that the Buffy comforter is crafted entirely from plant-based and recycled materials. The cover fabric features a 300 thread count and is made from lyocell, which is a natural textile derived from dissolving wood pulp. In this case, the lyocell is extracted from the wood pulp of eucalyptus trees. Eucalyptus is known for its antimicrobial and anti-inflammatory properties, so using it in the cover fabric is intended to offer sleepers a uniquely cool and soothing feel. Additionally, it’s designed to be resistant to mold, mildew, and other allergens trying to creep into your bedroom. So, again, the Buffy might particularly appeal to eco-friendly sleepers who also have allergies or sensitive skin. As far as what’s on the inside, this comforter is filled with a down-alternative eco-fiber spun from recycled PET bottles. The recycled, plastic PET bottles are spun into hypoallergenic polyester, airblown and then layered to achieve, as the folks at Buffy put it, “cloud-like volume.” Now, you may be thinking, “Sleep on plastic bottles? 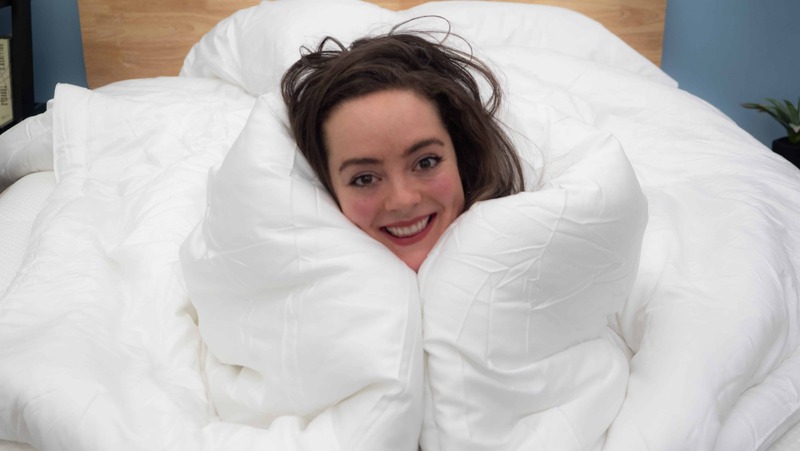 No thanks.” But I think you might be surprised by how this comforter feels (so keep reading to find out)! So, we know that the Buffy comforter offers a unique and super green construction… but how does it feel? And does it really regulate your body temperature? Well, let’s take a closer look. How Does The Buffy Feel? Before I even get into how this comforter feels, I have to say that it smells surprisingly wonderful. It might only be because it’s packaged alongside a complementary sleep mask that’s been filled with lavender and eucalyptus… So, I’m not sure how long this lovely aroma will last. However, when I first unboxed this comforter, I was met with the most dreamy, soothing scents. Also… Who doesn’t love a free sleep mask? The cover fabric of the Buffy feels very silky to the touch — similar to a sateen woven sheet. It’s got a very soft handfeel, and when I press into the comforter, I can feel the air flowing through the fabric. So, before I even nestled beneath this comforter, I could tell it was going to be breathable (which is good news for a hot sleeper like me). 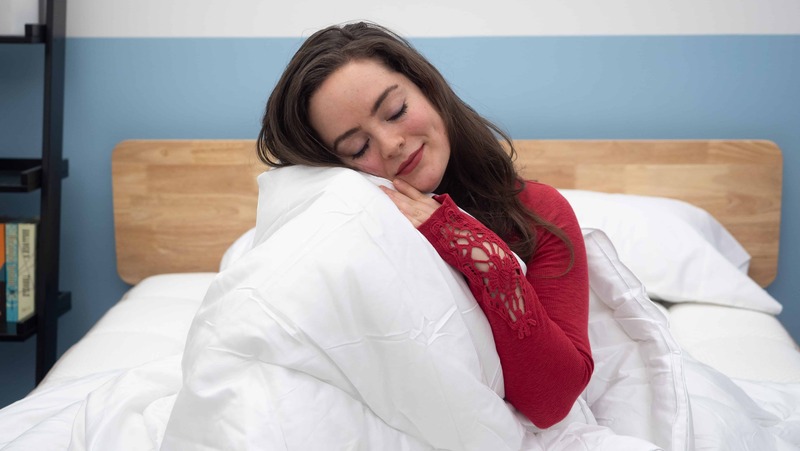 As far as the feel of the down-alternative inside this comforter, let me clear something up right away: It does not feel like you’re sleeping on plastic bottles. The internal fill feels light, fluffy, and feathery. I will admit, though, I was a little underwhelmed by the loft. The Buffy is great for sleepers with sensitive skin! It’s kind of a matter of personal preference, but I do prefer my comforters to be very lofty and cloud-like. Especially when it comes to down-alternative, I like to kind of get lost in the fluff. That being said, the lighter, less lofty nature of this comforter did further serve to keep me cool. So, I could definitely see myself using this during the warmer months. Personally, I can’t really say with certainty whether or not I experienced the temperature regulating properties of the Buffy as I pretty much always run hot. However, I can say that between the silky-cool cover fabric, and the light fluff of the internal fill, I never overheated while testing the Buffy. So, while I’m not convinced that I’d use this comforter for super cold nights, I’d happily enjoy the Buffy all year long. Q: Can I Return My Buffy Comforter? A: You have 30 days to return this comforter and, according the folks at Buffy, undamaged returns are distributed to local shelters to help those affected by homelessness. The loft of the Buffy comforter. Is The Buffy Comforter Good, Sarah? First of all, I love the fact that Buffy sends you a sleep mask with your comforter. And not only does the sleep mask offer the notoriously calming scent of lavender to ease you into dreamland, but it’s super cute as well! It’s a pretty bluish-purple color with clouds designed on it. Nice touch, Buffy. As far as the comforter is concerned, I have to say I really enjoyed my experience testing it. The eucalyptus-based cover fabric offers a uniquely cool, and silky feel that is, frankly, a refreshing change of pace. Don’t get me wrong, I love cotton (don’t we all? ), but I found the Buffy’s cover fabric to provide a very soothing quality that brings something special to the bedding game. Getting super snuggly with the Buffy comforter! While I do find the Buffy to be very cozy and soft, I was kind of hoping it would be a bit more voluminous. The exact fill power is not indicated on Buffy’s website, but I did feel that it was a little on the thin side. For cooling purposes, I found the lower loft of this comforter to be kind of an advantage. However, my personal preference is more in line with a down-alternative comforter that is so fluffy and lofty that I pretty much disappear beneath it. More: “Fill power” is used to measure the loft (or fluffiness) of a down or down-alternative product. The higher the fill power, the more fluffy and insulating the bedding will be! Overall, I found the Buffy to be a really cozy combination of cool, breathable, and lightly fluffed. Like I said, I prefer a comforter with a higher loft, but make no mistake — the Buffy is a great down-alternative option. The Verdict: Eco-friendly sleepers looking for a light-but-fluffy down-alternative comforter will be most compatible with the Buffy! Should I Try The Buffy Comforter? Alright, so we know that I like the Buffy… But let’s go over this comforter’s highlights one more time so you can decide whether or not it’s the right fit for you. Cool & Soothing — The eucalyptus-based cover fabric feels very cool and silky on the skin. Personally, I found it to offer a uniquely soothing quality that might be particularly beneficial for those with sensitive skin. Unique Trial Period — Something intriguing about Buffy is the trial period the company offers. Many of us are used to hearing about a trial period wherein you can test a product out, and send it back for a refund if you don’t love it. But Buffy does not charge you AT ALL until your trial period is up. So, you can enjoy this comforter for 30 days without spending one dime, and you’ll only be charged the day after your trial period ends. Of course, if during your trial period, you decide you want to send it back, you’ll never be charged at all, and Buffy will pay for any shipping costs. That’s a pretty amazing deal, if you ask me. Of course, there are a few things about this comforter that some folks might consider to be drawbacks. 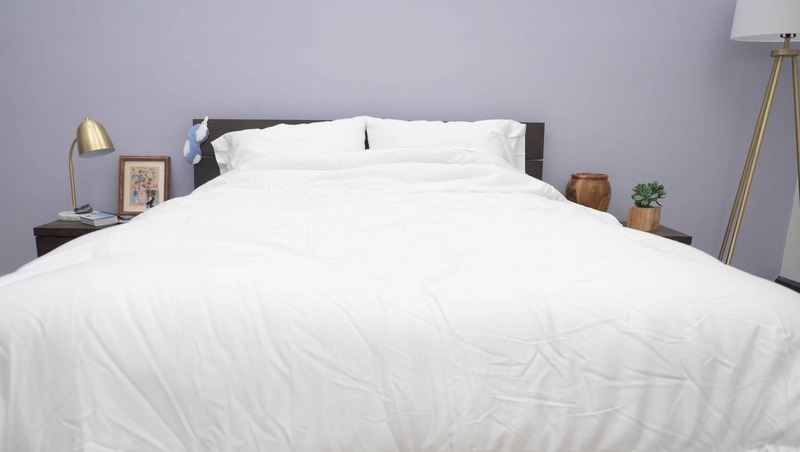 Value — While the trial period Buffy offers is very generous, this certainly isn’t the least expensive down-alternative comforter on the market. Many folks shop for down- alternative because it’s so much less pricey than down. So, with the Buffy ranging from about $120-$190, this comforter might be more than you were looking to spend for down-alternative. Wash Care — Though you could technically wash this comforter in a machine, the folks at Buffy say that it must be a larger, industrial size washing machine, or you could damage the comforter. So, they actually recommend that you have the Buffy dry cleaned in order to preserve its quality. Not everyone is going to want to do that, so, if you’re into very low maintenance wash care… this is something to keep in mind. Loft — This is a matter of personal preference, but I do kind of wish this comforter were loftier. When it comes to down or down-alternative, I love a nice fluffy, lofty construction that I can kind of get lost in. For me, this felt a little on the thin side. Shipping — Free shipping within the U.S. Shipping to Canada available upon request. Trial Period — You won’t be charged until after your 30-day trial period is up! Wash Care — Though the company recommends you dry clean the Buffy, you may wash it on a cold, gentle cycle with mild detergent, and then tumble dry on low heat.